How gorgeous is this new set? VERY! I was so pleasantly surprised to see these beautiful swirls, flowers, hearts & solid images in this brand new set, Boho Blossoms by My Favorite Things. Such a different style for MFT, don't you think? So elegant -- I love it! You'll be able to purchase it tonight after midnight (when it's officially October 1!) at My Favorite Things and I believe Eclectic Paperie will be carrying it, too. The base of this 5.25" square card is shimmer Poison Ivory. The black printed paper is Rookery Road from the Laurel collection by Scenic Route. 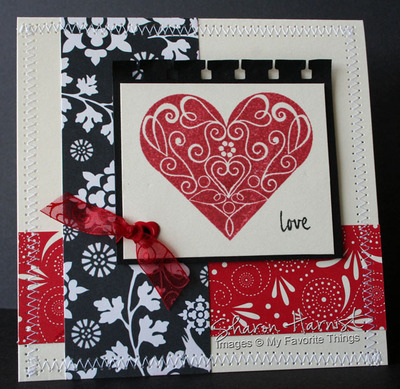 The red print is from Stampin' Up's Cerise double-sided designer paper. I machine zig-zag stitched both papers to the card base. The boho heart was stamped in Palette Moulin Rouge onto shimmer Poison Ivory and the "love" sentiment (don't you love that font?!!) was stamped in Palette Noir. This piece was matted with black cardstock that was punched with Stampin' Up's Spiral Punch. A red heart eyelet (retired SU) was set in the lower left corner and red swirly May Arts ribbon tied thru it. Don't forget that Kim will be running that great special tonight after midnight (it will be on the home page HERE) . . . Take 5 for $65. You get all these 5 new release sets that the design team has been previewing for you this week for $65! Check back in tomorrow to see a sample of the last of the October 1 releases . . . Think Pink! Any guesses as to what that set is about? It's Friday and time for another one of Beate's Weekend Sketch Challenges! And a challenge it was, since I didn't have any instructions when making this adorable file pocket card. 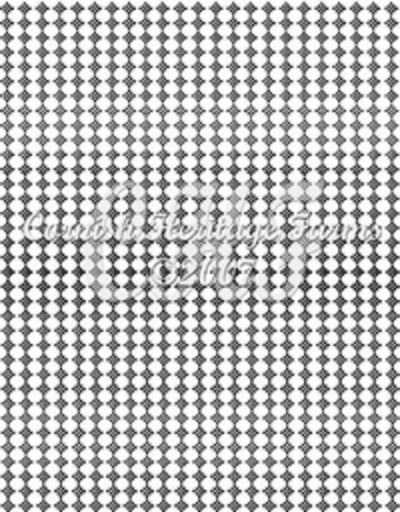 Beate has written a tutorial for this library pocket card for you, so be sure to check that out! I love pocket cards and Beate was a genius to combine hers with a file folder card! The stamp set I chose is "It's A Jungle Out There" that My Favorite Things will release this Monday, October 1 -- isn't it adorable? And a little bit different style . . . none of these animals are headless, I promise, LOL! Since I needed a new baby boy card, I thought this set was a perfect choice for this challenge. Since I have no idea how Beate did her card, I'll share how I did this one . . . Basically, I started this chocolate card base as Stampin' Up's large card/envelope size (I'm not sure this is a standard size on the general market? ): 6.25" x 4.50". Next, I cut 1/2" down on the left top back side, leaving a 2" tab on the right. Then I cut 1" off the left top front side, over to the 2" tab, and then an additional 1/2" off the right top front side, under the tab. All corners were rounded. 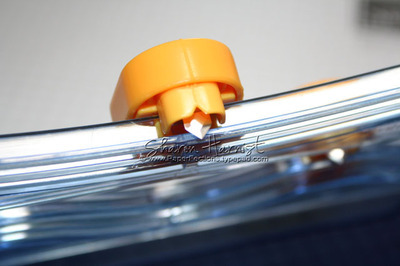 Tip: to round a cardstock corner with a corner punch in a tight spot that the corner guard won't allow the punch to cut, just take off the corner guard. 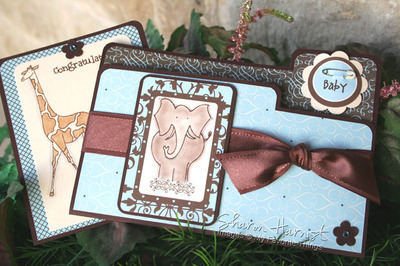 The tag was matted with chocolate cardstock and mounted with dimensionals to the card front. 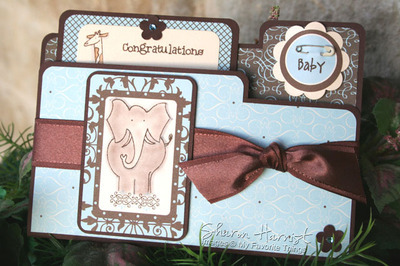 The pull-out giraffe card is chocolate cardstock 3.50" x 4.50" with a layer of printed paper (from the same pack) over it and then a 2.75" x 4" layer of shimmer Poison Ivory that the giraffe is stamped on, with Palette Burnt Umber. He was colored using a Copic marker. 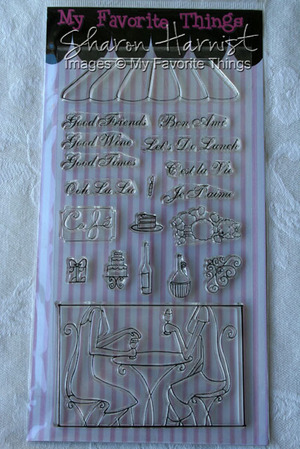 The sentiment "Congratulations" is from another My Favorite Things set, Sassy Sayings. Tiny chocolate flower punches from Stampin' Up's Three For You Punch Box accent the pull-out card and lower right corner of the card front, with blue A Muse Creative Candy Twinkle Stickers in their centers. 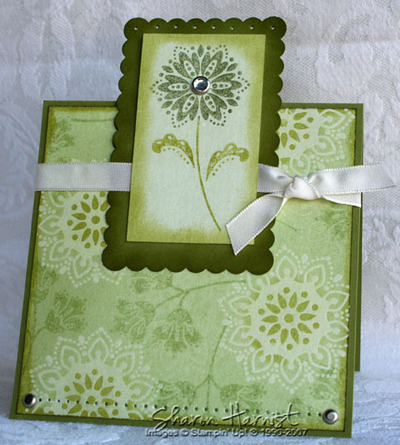 The flower accent on the tab was cut with the Cuttlebug Flower die from shimmer Poison Ivory cardstock. The brown & blue circle tag is from the same paper pack. "Baby" from My Favorite Things' Shower Time was stamped in the center. A tiny diaper pin was pierced thru the tag. Finally, wide chocolate satin ribbon was tied around the file folder, to keep it closed. This pocket card will be perfect to slip a gift card in to! Paper: Stampin' Up Chocolate, CutCardStock.com Poison Ivory, Paper Salon Enamored Designer Paper Pack. Accessories: Stampin' Up Three For You Punch Box flower punch & Ribbon, Pebbles Inc Shimmer Chalk, EK Success Corner Rounder, Cuttlebug + Flower Die, Dimensionals. 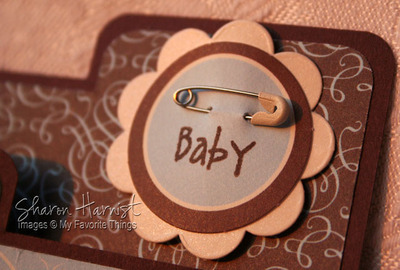 Diaper Pin-Unknown Source. Be sure to check out Beate, Charmaine, Jenn, Laurie & Lori's samples, too -- I can't wait to see what they did with this sketch! And check back in here this weekend, as I still have THREE more new release stamp sets from My Favorite Things to show you! Kim will be offering a "Take 5" Special, which will be all five new October 1 release stamp sets for $65! So be sure to check that out on the home page on October 1. My Favorite . . . Chocolate! Here's the first of My Favorite Things' new October releases . . . How Sweet It Is! Be sure to check out the other Design Team Members' blogs or galleries to see what they've posted today with this set . . . I'm sure the variety will give you lots of ideas! I used CPS32 for the layout of this card. 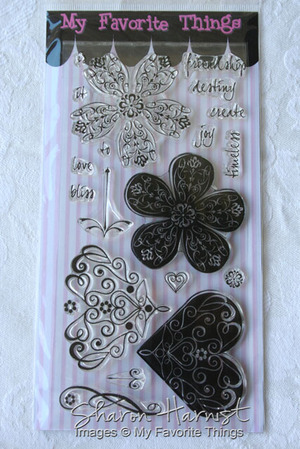 Knowing I wanted it to be chocolate themed, this retired designer paper from Stampin' Up! was a natural. I also wanted to challenge myself and not use the large image in this set which is a woman in a recliner. 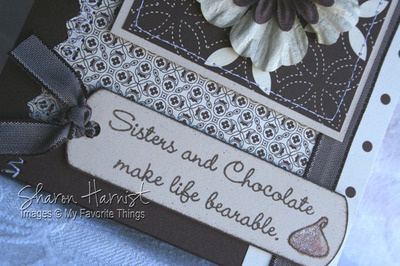 I loved this sentiment -- it would be perfect to pair this card with a gift of chocolate for a stampin' sis-tah (since I don't have any real sisters of my own)! After stamping the sentiment with Palette Burnt Umber ink, I added the chocolate kiss from this set to the little tag I created with Stampin' Up's Key Tag punch (I lengthened it). Inked the edges and punched a hole on the left to add the ribbon. The chocolate kiss is colored with a blender pen and cocoa ink pad, then Clear Copic Spica Glitter Pen was added, to make the chocolate gleam! The tag is also mounted with dimensionals to the card. Stamps: My Favorite Things-How Sweet It Is. 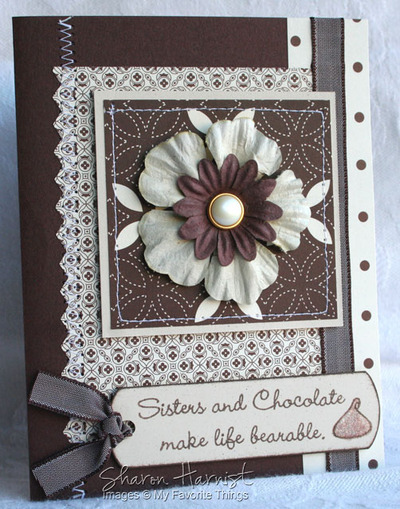 Paper: Stampin' Up Chocolate, Natural Ivory, Au Chocolat DS Designer Paper (ret). Accessories: Stampin' Up Chocolate Taffeta Ribbon & Key Tag Punch, Prima Flowers, Karen Foster Pearl Brad, Clear Copic Spica Glitter Pen, Sewing Machine & Thread. Check back tomorrow to see the next release MFT has in store for you! 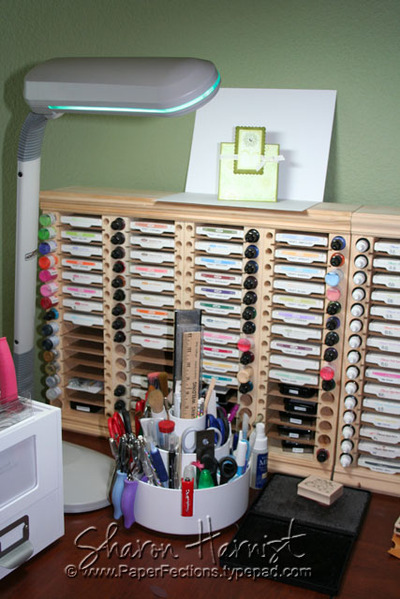 I'll be combining it with Beate's Weekend Sketch Challenge (which is really going to be a challenge for me)! October and Halloween are rapidly approaching . . . Do you have crafty ideas and projects to celebrate the holiday? If so, do you want to be featured in Craft Critique's next Carnival? The next carnival is all about Halloween! To have your project included please email any links from either your projects or your favorite crafty blogs and websites to Craft Critique by September 28 at 10pm. And feel free to email Melissa if you have any questions. Be sure to go ahead and check out Craft Critique this week, as there are some great Halloween projects/supplies being featured that will give you many fun ideas for the holiday! Check back in tomorrow, when I'll start posting samples over the next few days of FIVE new My Favorite Things stamps that will be released October 1! What's for dinner tonight (or last night, in my case!)? I don't cook from scratch that often, but when I do and when I find a good recipe I really like, I like to share it! 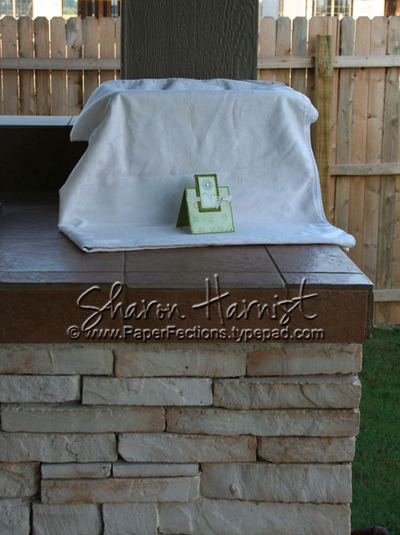 This one is pretty easy and makes your house smell SOOOOO good! It's a combination of recipes I've had or found and trial and error. It only takes about 45 minutes to 1 hour, so it's fairly quick as well . . .
1 heaping tsp. chicken base (I use Better Than Bouillon paste brand or you can use bouillon cubes). 1 boil-in-bag of whole grain brown rice (I use Success brand) - cooked using in-pot directions instead of in bag. 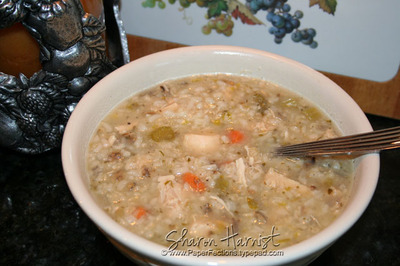 Use 2 bags of brown rice if you want to have a HUGE pot of soup and plenty of leftovers! When chicken is done (about 25 minutes), remove & discard chicken skin and cut chicken into bite-sized pieces. Return chicken to pot, still simmering. When rice is done, add to chicken pot. 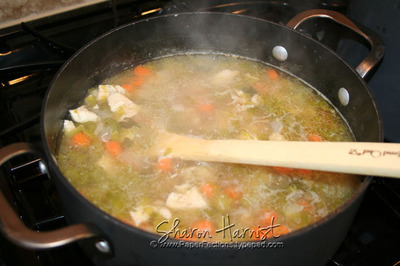 Add 2-4 cups of water, depending on how much chicken stock your rice absorbed, until it's the consistency you like. You can still simmer this until it's time to eat (VERY low for about 30 minutes -- but not much longer than that or your rice will get too mushy), or it's pretty much ready to eat once you mix it together & reheat a bit. This makes a huge pot, enough to freeze and save for later . . . my kind of cooking -- another meal ready in moments from the microwave! I hope you enjoy . . . let me know if you try it! Backgrounders & More Backgrounders, Oh My! Aren't they amazing? So many possibilities! I just received some yesterday, so as soon as I get a chance to play with them, I'll post some samples for you. In the meantime, you can view them all here at the store and see what the Design Team has already created with them, here in the gallery. I usually take all my photographs outside, in natural indirect light -- I find my camera focuses a little better and colors are truer. If it's very cloudy and/or rainy some days, I still photograph in the same spots and if a photo turns out a little too dark for my liking, I can usually adjust the contrast in my photo editing software just fine. The first spot is on my back covered patio -- it faces northwest and is usually protected by direct sunlight until late in the evening. I just drape an old white tablecloth over a box and use that as my backdrop. 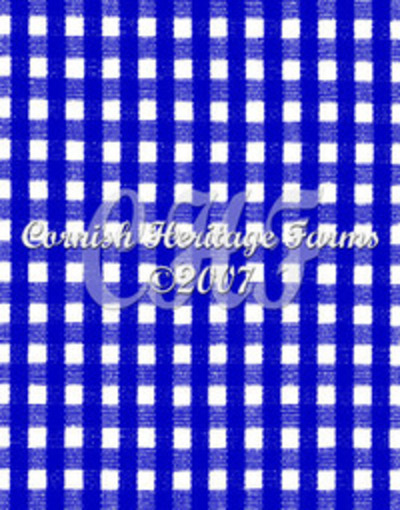 As you can see, the tablecloth needs some ironing but since I usually crop my photos pretty closely, that doesn't matter! I take my photos closer up, obviously -- I'm just giving you the whole picture here. Normally, I shoot my photos in the "automatic" setting, so the camera does all the focusing and exposure work for me -- I find that works best for now (until I can learn to use it better manually!). I usually adjust the 18-55mm telephoto lens as far out as possible and the just move the camera close in to the project, until the project fills the frame. In other words, I'm using more towards the 55mm lens length further away and not the 18mm length with the camera up close to the project -- make sense? This spot usually gets quite a bit of morning sun but this particular morning was partly cloudy, so I didn't have much glare from the direct sunlight -- until I wanted it for a closeup of the sparkle I was trying to capture and just waited a few moments for the sun to peek back through the clouds. I usually prefer the indirect lighting, as I think direct sunlight usually washes out my photos a little, the colors aren't as true, and I don't care for the shadows it leaves behind the project or popped-up details in the project. So, no fancy light boxes here -- just the natural outdoors most of the time. I think that if you fiddle with the lighting features in your photo editing software, most of the time you can make do with the resources you already have! Emboss resist is a fun technique and has become a favorite of mine. Here, I stamped the large flowers from Stampin' Up's True Friend on the shimmer light green background cardstock (as opposed to the usual glossy white cardstock for this technique) in Versamark ink and then clear embossed them. Then a few more large flowers were stamped in Versamark and just left to dry. 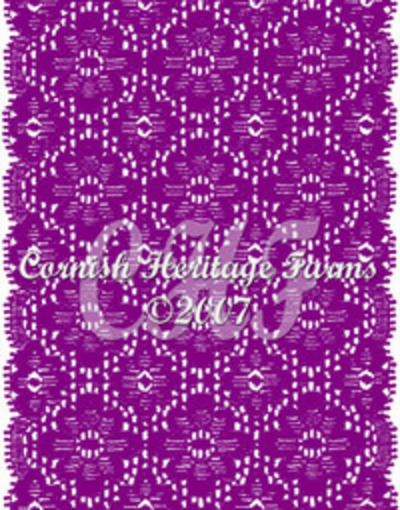 These will leave a slight ghost image to your background, not as prominent as the embossed flowers. 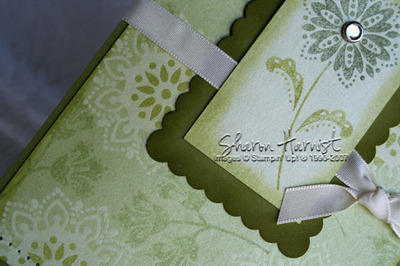 The 4.25" square card base is olive cardstock and so is the scalloped mat behind the large focal flower -- it was just sponged with olive ink to darken it. The large focal flower was inked with a celery marker on the leaves & stem and artichoke marker for the flower head, and then stamped. A clear crystal brad was used for the flower center. A little paper piercing was done to the top scallop and bottom of the card. Some vintage silver brads and white taffeta ribbon finish off this card. 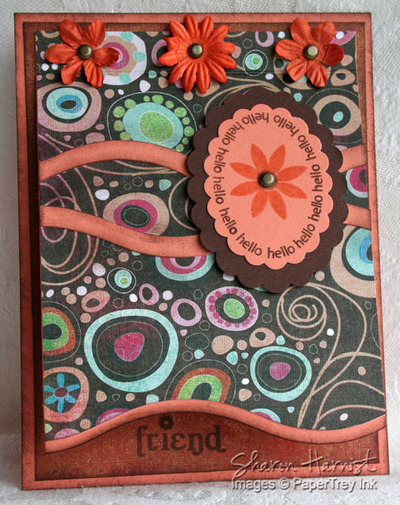 Stamps: Stampin' Up True Friend. Paper: Stampin' Up Olive, Stardream Serpentine Metallic Cardstock by Gruppo Cordenons from CutCardStock.com. Ink: Stampin' Up Classic Celery, Olive + Artichoke Marker, Versamark. Accessories: Brayer, Sponge Dauber, Sponge, Clear Embossing Powder, Vintage Brads, White Taffeta Ribbon, Pretties Kit (crystal brad), Paper Piercing Tool. 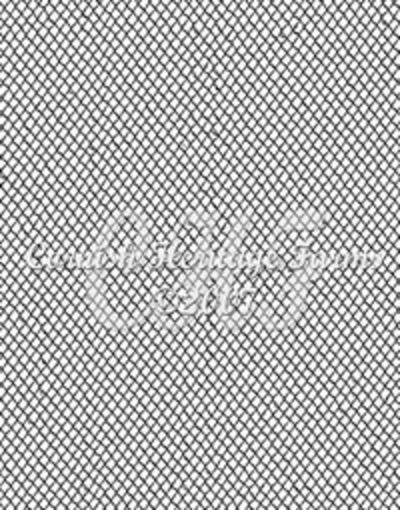 Marvy Giga Scalloped Square Punch. I hope you all enjoy the weekend -- check back a little later today for a photography tutorial I've been working on! It's time for another one of Beate's weekend sketch challenges . (< click that link to see the sketch)! 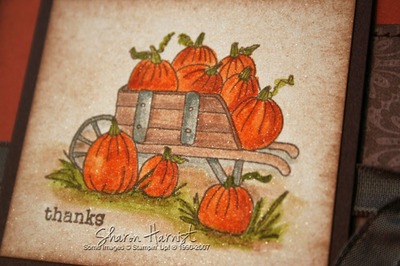 I'm still on my Fall pumpkins kick, so I used this adorable Pumpkins in Wheelbarrow by Lockhart Stamp Company. 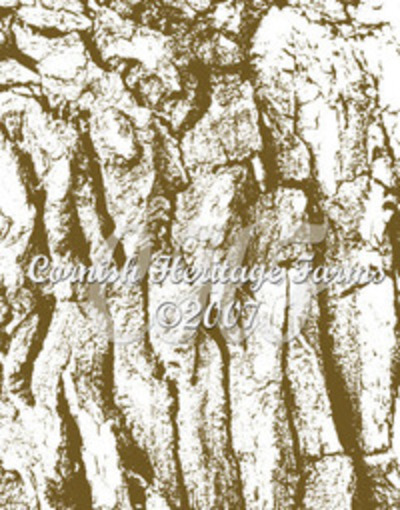 The background of this image and the edges were lightly sponged with caramel ink, to tone down some of the bright whiteness. Then the image was matted with chocolate cardstock and popped up with dimensionals. The A2-sized card base is rust, to match the printed designer paper. The brown paper square was machine stitched to the card base and the lower left corner stitched as well. Antique brass brads and chocolate taffeta ribbon finish this card. Stamps: Lockhart Stamp Company Pumpkins in Wheelbarrow, Stampin' Up Everyday Flex Phrases. Paper: Stampin' Up Really Rust, Chocolate Chip & Apple Cider Designer Paper. Arjo Wiggins Curious Iridescent Cryogen White from CutCardStock.com. Ink: Stewart Superior Palette Burnt Umber. Stampin' Up Classic Pumpkin, Olive, Caramel, Gray. Accessories: Stampin' Up AquaPainter, Dimensionals, Vintage Brads, Chocolate Taffeta Ribbon, Sponge. Sewing Machine & Chocolate Thread. 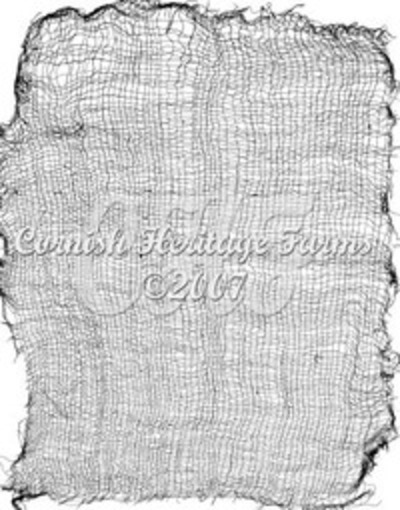 Be sure to check out the samples made by Beate, Charmaine, Jenn, Lori , and also joining us this week is Laurie -- I'm sure they will knock your socks off and give you many ideas to try for the sketch this weekend. Thanks for the great sketch, once again, Beate! I used my interpretation of CPS31 for the layout of this card. I really like the sketchy style of this Holiday mini catalog set by Stampin' Up -- Autumn Harvest. I stamped the pumpkins on watercolor paper, masking them, and colored them using dye reinkers and an AquaPainter (water reservoir brush). 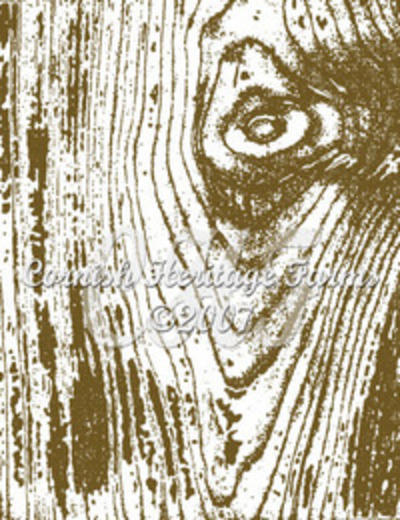 Canvas background was then stamped over the image, to give it a look of burlap. The edges were inked and distressed and the image matted with chocolate cardstock. 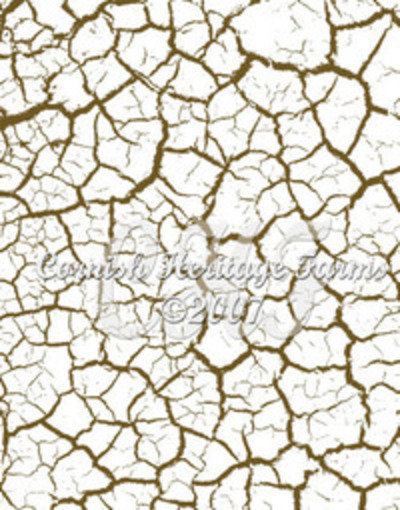 The background layer is River Rock -- one of Stampin' Up's new In Colors this year. This color is very versatile -- it takes on different hues according to what colors it is paired with. Here, it looks very green next to the rust! I stamped the leaf from this set in River Rock ink onto this layer, then it was machine zig-zag stitched in chocolate thread to the card base. 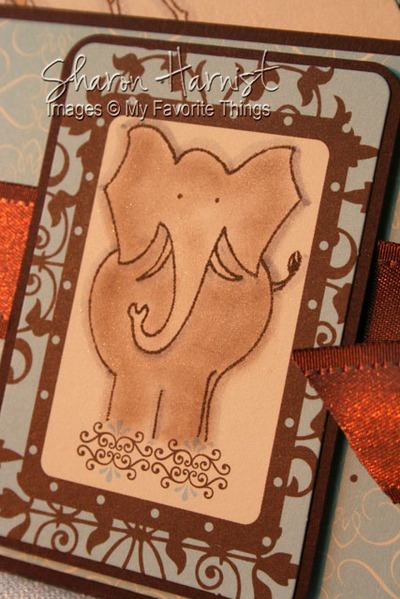 The chocolate card base is 6.25" x 4.75" -- Stampin' Up's large size. The chocolate side tabs were created with SU's Large Oval Punch and Jumbo Brass Eyelets set in the middle. Pumpkin ribbon runs under the popped-up focal image and thru the eyelets. Since this card will serve a multi-purpose, I chose to leave off a sentiment. I hope you are enjoying the Fall weather where you are . . . it was a nice, cooler one here today but still quite warm! OMGoodness, I've seen this going around blogs and then Beate tagged me to play along. Some of these are quite hilarious (at least to me)! If you'd like to play along, consider yourself tagged and let me know by posting below and I'll come check it out! 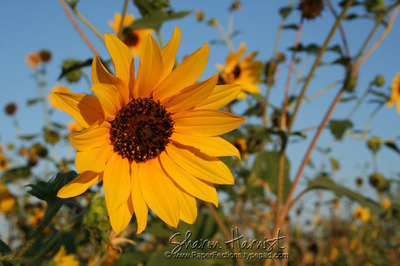 Here's that photo I promised of the sunflower field by my house that inspired my September Sunflower calendar page. Aren't they pretty -- especially against that beautiful blue cloudless-sky this morning. 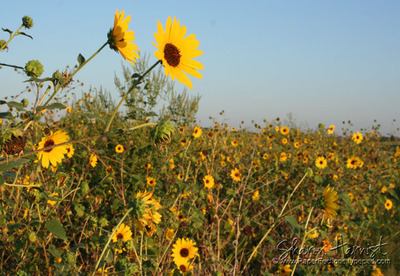 A few of the blooms are already spent and this field is on the downhill side of its lifespan -- it was much prettier last week. I love getting inspiration from nature, especially all the seasonal color palettes. I hope this photo might inspire something you do today -- have a good one! I've had several requests lately for the source of the shimmer ivory cardstock I use (that my friend, Lori, got me hooked on!). I usually try to list all my project details and sources (and links to those sources) either within that project post or in the "recipe" section at the end of each post. I've now added the link to CutCardstock.com (where you can get that shimmer ivory cardstock) to my right sidebar under the "Places I Highly Recommend" section. It's called Poison Ivory Curious Iridescent by Arjo Wiggins in the 89 lb. cover weight. 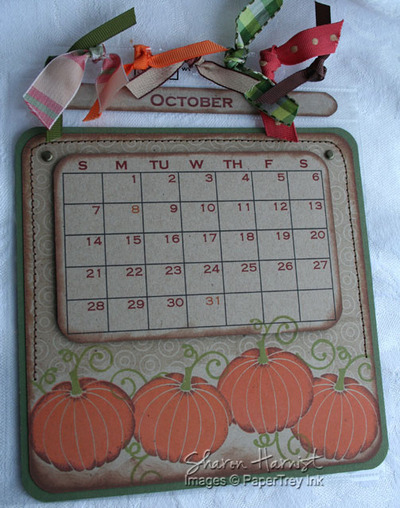 The 6" x 6" scrapbook page protectors I used for my Vertical Album Desk Calendar pages are by Stampin' Up! I guess I did a pretty good job of covering up the SU! 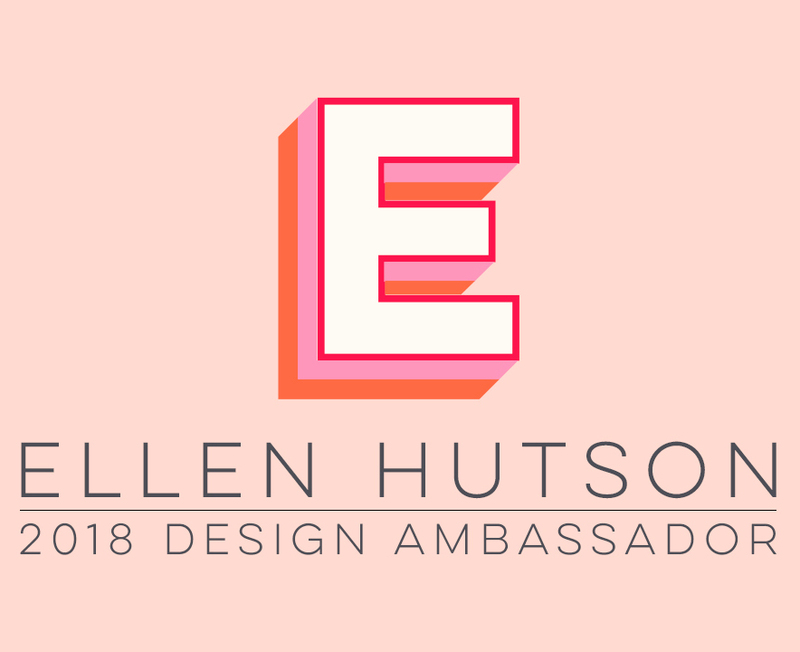 logo with all that ribbon (that was my goal!). The ones I used for that project that have the extra space at the top (where I put the name of the month) between the ring holes and page pocket are made for post-bound albums. If you don't want that extra space at the top, you can use the ring-bound album page protectors that are shorter and only have the ring holes at the top. I hope that makes sense -- if not, please let me know! 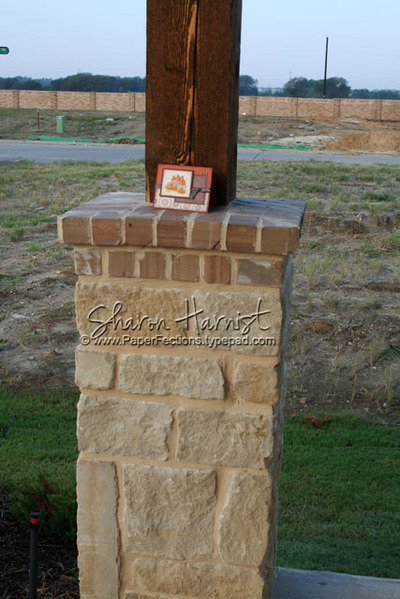 My September Craft Critique article is up at the site. I'll post it here, too, but be sure to check out the articles the reporters have been posting this week about Blue Grass Publishing -- they have several guidebooks for scrapbookers and papercrafters that you may find useful. 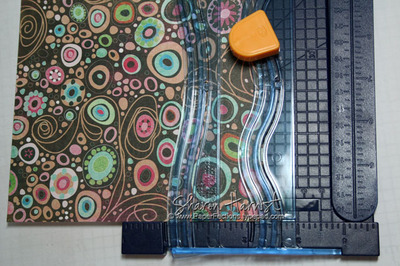 In almost any paper crafting magazine or scrapbook store you will see that waves are all the rage right now, so join me as I check out for the first time Creative Memories' 12-inch Decorative Trimmer . 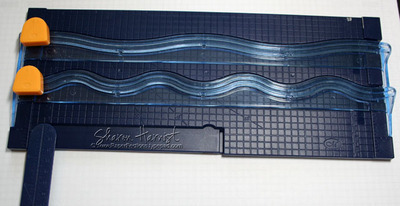 . .
As you can see, you get two products in one with this trimmer -- a wave and a swell cutting channel. 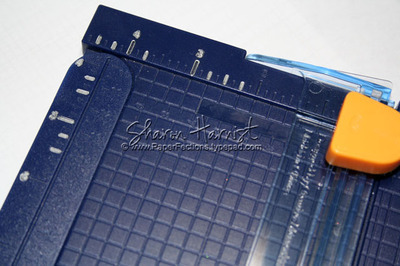 The length for this trimmer is a full 12.5 inches, so this means it won't bend or crimp your 12-inch cardstock or decorative paper -- a nice bonus. A close look at this trimmer's blade reveals something I've never seen on a trimmer -- a beveled, very long V-point blade. This two-sided blade boasts 1000 cuts and my Creative Memories consultant suggests keeping a blade for photo trimming separate from the one to use for paper or cardstock, to ensure it is always sharp and won't tear your photographs. To date, I have not experienced any fraying of lighter weight cardstocks or printed papers when using CM's Straight Trimmer, which features the same blade -- another nice bonus! Perfectly straight cuts are also achieved with the straight trimmer . . . some of my other trimmers fail miserably in this area. But watch out for that beveled blade -- it's the sharpest I have experienced yet on a trimmer! The precision of this trimmer and blade is unmatched in my opinion -- just look how thin of a cut you can get on this faux ribbon shape! 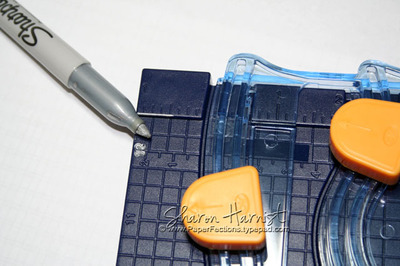 Creative Memories 12-inch Decorative Trimmer can be purchased from your local Creative Memories Consultant for (US) $24; or the 12" Straight Trimmer for (US) $20 -- very reasonable, in my opinion. Replacement blade cartridges are also available. So catch the wave craze and try out this trimmer, I'm sure you won't be disappointed . . . I sure wasn't! Here's the October calendar page for my Vertical Album. It is stamped with pumpkins from PaperTrey Ink's Spooky Sweets set. I liked how these pumpkins can either be whimsical by adding the included jack-o-lantern face, or stamped simple & elegant. I stamped these onto kraft cardstock using the rock & roll technique and masking them. 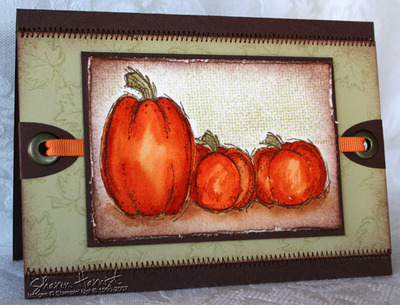 The background behind the pumpkins was stamped in Versamark using the rectangle stamp patterned with circles. Then the background was sponged around the edges with chocolate ink and machine stitched with chocolate thread to the artichoke base. All corners were rounded. Stamps: PaperTrey Ink Spooky Sweets. Paper: Stampin' Up Kraft & Artichoke. Ink: Clearsnap Colorbox Fluid Chalk Tangerine, Olive Pastel & Chestnut Roan. Accessories: 6x6 Scrapbook Page Protector, Vertical Album, Sewing Machine & Chocolate Thread, Stampin' Up Antique Brass Brad & Dimensionals, Ribbon, Computer-Printed Calendar. That's all the pages I have right now but I'll gradually be working on them over the coming months and will share them when I'm finished!